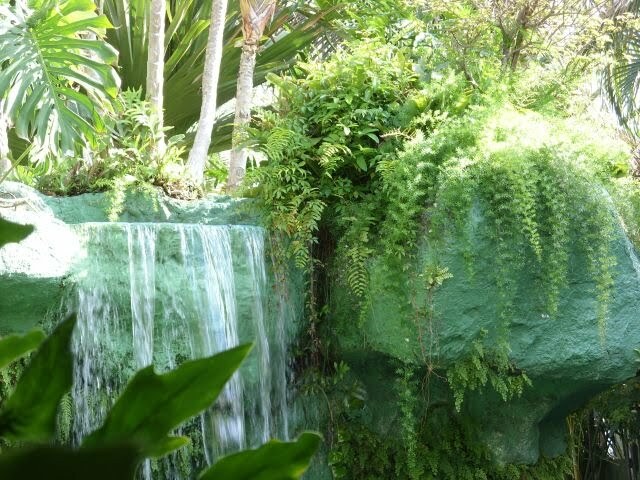 How would you like to have a dinner outside in a tropical garden next to a waterfall? Would you mind if the waterfall was a "prefab" and from a fountain? You probably shouldn't mind since the place is absolutely gorgeous and lush and unlike anywhere else I have ever been before. This weekend we celebrated Kevin's Birthday. It was another trip to Mai Kai, which is a Polynesian restaurant near me over in Fort Lauderdale. It's about 3 miles from the house and a world away. They have their shows, and I have never seen them except by passing through the building on my way in or out. 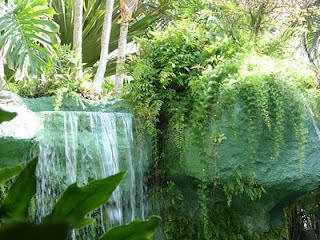 Being as tall as I am, the building's decor which can best be described as below decks meets Polynesian kitsch, I walk through ducking my head through the beauty of the indoor waterfalls and out to the Lanai. The Lanai is open to the elements with a bamboo railing and palm frond accented roof. The view we get is the one you see in this picture, and luckily for us they seem to seat us at the same table each time we go. Coincidence of our habit of liking an early dinner and getting in just as they open. I had the barbecued pork tenderloin that was cooked in the Chinese Oven. It's a method that seems to be as if you have skewered your main course on a metal pike then hung it in a chimney. The pork comes out amazingly tender, unlike anywhere else that I have ever had. Have a "Barrel of Rum" to drink with, but don't drive home. It actually lasted me through the meal and well into the evening after we had dessert of Chocolate Mousse Cake. Redundant, yes I know, someone with the long time nickname of Moose having a Mousse cake and so forth. It was excellent and absolutely worth the calories. Thank you Kevin for allowing me to share your uninterrupted company at the restaurant. I truly enjoyed it. One more week to the 20th Anniversary. Wow! I had better start baking!